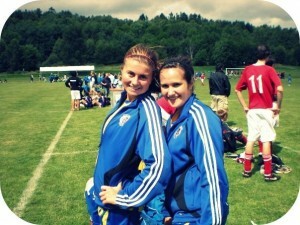 Gothia Cup when Dr. Shadley was 16 y/o. Growing up, I was never one who liked going to the doctor or taking medication. My first chiropractic experience was due to a soccer injury to my back, and my mom thought it would be a good idea to take me to see her chiropractor. I was playing competitive soccer internationally in Sweden for the summer (at the Gothia Cup), and my back was bothering me significantly once I got home. I was 16 years old, and I had no preconceived ideas of what chiropractic was. I went into it completely open minded, as it was normal for my mom to get adjusted regularly. After only a few visits, I was feeling so much better, and (even better) I didn’t have to take any meds! I think my favorite part of that experience was how he teased me that my left leg was shorter than my right, so he wondered if I just walked in really fast circles to the left. I fell in love with the natural and holistic mindset, purely because I was astounded that chiropractic existed and not everyone was utilizing it. I wanted to help people, and I knew that I didn’t want to be a doctor who just wrote a script, but didn’t address the underlying issues. I didn’t want to be a “band-aid” of sorts. I wanted to make a difference in people’s lives. From the time I started care with my chiropractor in Canada up until the time I graduated high school, I made sure to get as much exposure to the career as I could. I shadowed him quite a bit to learn as much as possible before heading off to Michigan State University. He truly influenced my decision to become a a chiropractor. As I studied my way through MSU to earn my BSc in Kinesiology, I knew the whole time that I was headed to chiropractic college afterwards. There was a short time where I considered med school, but I ultimately decided that I didn’t want to spend all of my education learning about pharmacology, and I knew I wouldn’t be happy in that learning environment. I completed my senior internship in a great chiropractic office in East Lansing, which helped solidify my plan. 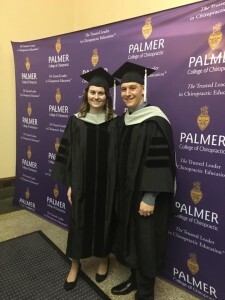 After graduation, we headed to Palmer College of Chiropractic in Davenport to start our graduate program. Gentle chiropractic care for kids. It was through my experience at Palmer that I found a passion for pediatric chiropractic. I enjoyed seeing such amazing results in such a short time with my pediatric patients. 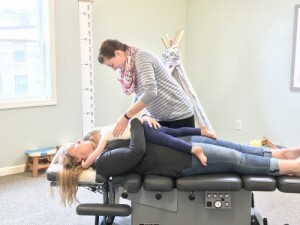 Babies and kids respond so quickly to specific chiropractic care, and I was hooked. I was able to work with kids previously diagnosed with ADHD, autism, developmental delays, ear infections, and colic. I truly felt like I was able to make a difference in their family’s lives as a result of chiropractic care. It wasn’t until I graduated that I found my absolute passion for pregnancy and postpartum care. After attending the Webster seminar through the ICPA and becoming Webster technique certified, I knew I had found what I was supposed to do. That seminar really opened my eyes to the birth world and how women are treated throughout pregnancy, labor, and birth. I then decided to pursue becoming a certified BIRTHFIT Professional to further educate myself on pregnancy care for women, but more for the postpartum side of things. 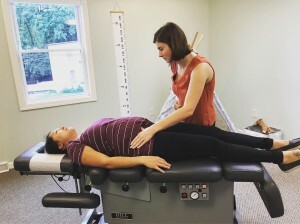 Postpartum is such a forgotten time for women, and I wanted to be able to provide my practice members with the best possible care before, during, and after their pregnancies. I am constantly studying and learning, trying to become the best prenatal, postpartum, and pediatric chiropractor I can be. I have a whole list of seminars specific to pregnancy, postpartum care, and kids that I will be working towards in the years to come. For now, I will continue to provide exceptional care to the families in our office and empower women to have the birth experience that they desire. To schedule an appointment with Dr. Shadley for prenatal, postpartum, or pediatric chiropractic care, click here.